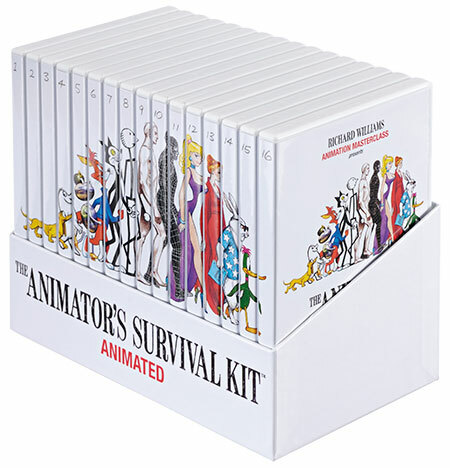 Richard Williams has combined his best-selling book, The Animator's Survival Kit, with his legendary Masterclasses to produce this 16-DVD box set. Filmed over four days at Blue Sky Studios in New York, the Masterclass is intercut with over 350 specially animated examples. During his 50 years in the business, Williams has been one of the true innovators. Dedicated to passing on his knowledge to a new generation of animators so that they in turn can push the medium in new directions, here he reveals the secrets of the masters, distilling his experience into a working system that makes animation better and easier to do. You've read the book – now see it filmed. All customers should note that to ensure security and reliability this item must be despatched by our special courier option. Important: click for delivery and VAT options, which differ from our usual arrangements. Customers based outside of the EU please note you will not be charged VAT, despite the pricings as listed in the shopping basket! Fantastic coverage of the interview with Richard at the LA Academy 'Marc Davis Celebration of Animation' where a key exhibit is based on Richard's work. See clips and a review on the Animation World Network. "Richard Williams's 16-DVD box set is an impressive and impressively packaged expansion of his best-selling book of the same name. Based on the now legendary Masterclass he taught at Blue Sky Studios in New York, actual footage of the class itself has been combined here along with over 400 specially animated examples of the principles he covers. Between the classic and in-depth nature of these lessons and William's touching sincerity, generosity of spirit and profound love of the art form, if he had titled the set "Animation's Survival Guide", he would not have been wrong." "Everything you need to know about animation: just supply your own talent, discipline and dedication. 10/10"
"...there is nothing better than the Richard Williams' Animation Masterclass." Jan Pinkava Oscar winner Geri's Game and Co-Director Ratatouille. "When an animation great like Richard Williams offers you the fruits of his experience - his knowledge, his craft - packed into a box and fully illustrated with moving pictures, just say "thank you!" and hand over the cash. Then use it." John Canemaker, NYU Professor, Author, Oscar-winning animation filmmaker. "Richard Williams shares his milestone DVD collection The Animator's Survival Kit (Animated) with unparalleled generosity. His knowledge and expertise has been passed on to future generations of animation students and professionals. By viewing them one is immediately connected to the work of the animation Masters in a way that subject specialists can only dream about. Richard's visual Master classes reach his audience though the most authoritative, entertaining and accessible performance which not only addresses the importance of the craft, the hard work and commitment to succeed, but also the FUN of doing it! This DVD Master work will have a profound influence on the teaching and understanding of animation for years to come". Professor Peter Parr,Reader in Animation,The Arts Institute at Bournemouth. "Absolutely fantastic. A revelation to me and a dream come true. If I'd had this information 10 years ago, my life would have taken a completely different course. The cost seemed a bit much at the time of purchase, but after viewing everything (most of it 2 or 3 times) I can't imagine there being any college course or program with information that good and that extensive. Both the content and the history of its development, and right from the mouth of someone in the middle of it. For me, it's perfect. I can train myself AND continue working full-time and there's nothing better. " "If you want to learn technique from the man who directed Roger Rabbit, the Pink Panther and a lot of other famous as well as forgotten stars, his book and DVD set should be near your computer or drawing table. Although the DVD set is considerably more expensive than Williams' book, the price is a bargain if you feel you will learn more by seeing and hearing Williams lecture and drawing on large white boards before a group of animators. Each disc includes lots of animated sequences (over 400 of them in the set) and you can stop and single frame your way through each example if that will help you see what he is talking about. If you take your career seriously and really want to learn or improve your character animation skills further, this DVD set could be a good investment. It is similar to the book much of the time, but it contains lots more information and embellishments and Williams delightful personality." Animator's Survival Kit iPad App OUT NOW! Find out more here. Richard Williams was the creative mind behind the animation of the worldwide smash hit Who Framed Roger Rabbit for which he won two Oscars. He directed and designed Roger and Jessica Rabbit, Baby Herman and all the new characters for the Walt Disney/Steven Spielberg blockbuster. British-based Williams has won 3 Oscars, 3 British Academy Awards and over 250 other international awards. His 50 year career in animation includes The Return of the Pink Panther, What's New Pussycat, Casino Royale, The Charge of the Light Brigade and the Oscar-winning A Christmas Carol. 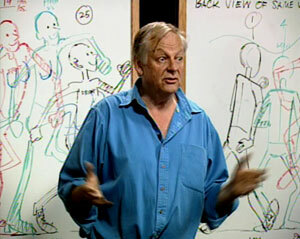 In the 1990s he gave the Richard Williams' Animation Masterclasses around the world to participants from studios such as Disney, Pixar, ILM, Dreamworks /PDI and Warner Bros, culminating in his best-selling book, The Animators Survival Kit (2001). Click for more information about The Animator's Survival Kit Animated.